Not recommended for keyboard trays wider than 19"
The only mousing platform that lets users adjust their mousing position in all three dimensions for maximum comfort. With height, depth, lateral and tilt adjustability, it can be positioned where it’s needed for truly custom support. It can also be easily moved from one side of the keyboard to the other for left- or right-handed use. NOTE: Clip Mouse installation involves drilling holes and using screws to secure the rail under the keyboard platform. Purchase only if you are extremely handy. Question: Hi i am interested in buying your clip mouse platform, but my keyboard mount is not Humanscale. Is it possible for use this clip mouse platform with other brands? Answer: The Humanscale 90 or 90H or 91 or 91H Clip Mouse Platform will only be compatible with Humanscale keyboard trays. Question: What is the difference between Humanscale 91 and 91D? Do I get two mouse trays with the 91D option? Or, if I am looking to order a mouse tray for the left AND right side of the keyboard tray, do I need to order two 91s? Answer: If you want left and right mouse trays, you do not need to order two 91s. The 91D is a dual mouse platform with each platform 10" in diameter. The 91 is a single mouse platform which is 10" in diameter too. 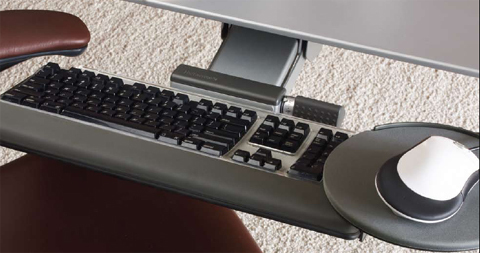 The Humanscale clip mouse platform is a user-friendly addition to a keyboard tray. It is sturdy and offers a nice range of lateral and height adjustments. Lastly, ErgoDirect provided good service, helping answer questions in advance and arranging for a fast delivery of the product. Thanks!